Samsung unveils its new smartwatch ‘Galaxy Watch’. August. 27, 2018 08:35. by Dong-Jin Shin shine@donga.com. Samsung said Sunday that the Bluetooth and the LTE network supported models of Galaxy Watch will be released on Monday and Friday, respectively. The world’s largest smartphone maker’s release of its new smartwatch came in two years after it last launched the Gear S3 in 2016. Samsung’s Gear brand, which had been used since its first smartwatch introduced in August 2013, has now faded into history. For the first Galaxy Watch, the company paid attention to the “basics” of a watch. 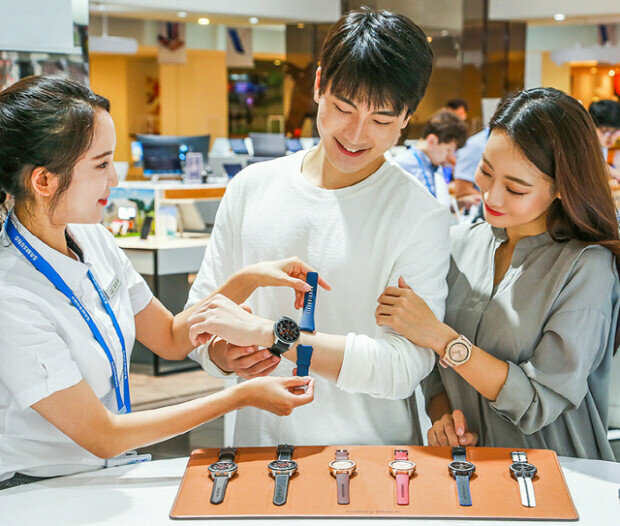 Samsung said during a briefing Friday that the design and features of its latest smartwatch will give users the natural feeling of an analog watch. With a larger battery and chipset, the 46-millimeter edition can run for 80 hours on average, or up to 168 hours if it is set to minimum power mode, while the 42-millimeter edition can run for 45 hours straight without recharging with up to 120 hours of battery life. The smartwatch also boasts enhanced durability as it is made with Corning’s glass for wearable devices, and users can also customize the watch with a selection of watch faces and straps including options from Braloba, a Swiss manufacturer of high end watchstraps. The software of the smartwatch has been further advanced. The smartwatches feature morning and evening briefings, providing users with necessary information ranging from weather to schedules. The device’s upgraded health care-related features display and automatically record the time users have spent exercising and calories burned. The watch can keep track of up to 39 different exercises, measuring calories consumed and how many times users work out. The Galaxy Watch also works more directly with the company’s Galaxy smartphones. For example, users can check their calorie consumption on the Galaxy Watch after typing in the calorie intake on a smartphone.